We provide an analytical model for efficient dynamic capacity allocation in IEEE 802.16 wireless metropolitan area network, where the nonreal-time traffic can utilize the bandwidth unused by the real-time traffic. We investigate the uplink delay of the nrtPS service flow as a function of the capacity allocations for the rtPS (ertPS) and UGS service flows. Unicast polling is applied for the bandwidth reservation of the nrtPS and rtPS (ertPS) packets. Our analysis accounts for both reservation and scheduling delay components. The nrtPS packets arrive according to Poisson process. 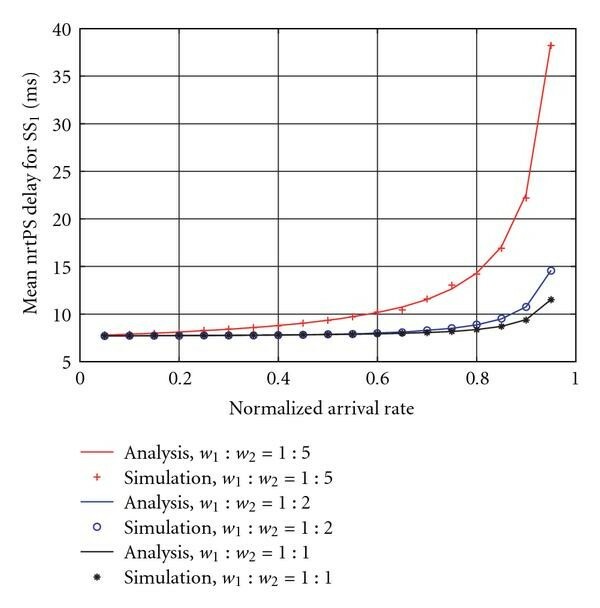 The model enables asymmetric capacity allocation, as well as asymmetric nrtPS traffic arrival flows. The analytical model is applied for investigating the influence of the real-time traffic on the delay of the nrtPS service flow. We discuss also the determination of several traffic parameters under different constraints, which have potential applications in network control. IEEE 802.16 standards family defines an air interface for Broadband Wireless Access (BWA) system. As the result of a recent revision, the contemporary core standard IEEE 802.16-2009  consolidates the IEEE 802.16-2004 standard with several amendments. According to , this wireless interface is recommended for Wireless Metropolitan Area Networks (WMANs). The high-speed air interface specified by the IEEE 802.16 standards family enables multimedia services and provides support for several traffic types to ensure the wide range of Quality-of-Service (QoS) requirements of end users. The standardization of metropolitan-scale wireless access is an ongoing activity performed by the IEEE 802.16 Working Group for BWA with the support of WiMAX Forum . The uplink data packet scheduler, which is out of scope of the IEEE 802.16-2009 standard, has a major impact on ensuring QoS requirements of the end users. As a consequence, numerous research papers deal with the problem of scheduling, like [4–6], in which various frameworks are built and analyzed to guarantee a specified level of QoS. For instance, the work in  proposed an efficient QoS architecture, based on priority scheduling and dynamic bandwidth allocation. In , authors compare and contrast the performance of various reservation schemes in the framework of the simplified model. For a good summary on QoS in the context of IEEE 802.16, we refer to the online paper . The majority of the analytical works in the literature do not account for both the reservation and the scheduling components of the delay. The importance of accounting for both components to evaluate the overall delay of access-control systems was emphasized by an early fundamental theoretical work by Rubin , as well as by our previous papers [11, 12]. For a more practical approach, we refer to , in which the realistic performance measures of IEEE 802.16 system are considered by various techniques. In [13, 14], the overall system delay is approximated and verified. In our previous work , we established an analytical model for the exact overall delay of the nrtPS service flow with unicast polling in the IEEE 802.16 system. Other polling techniques were studied in . 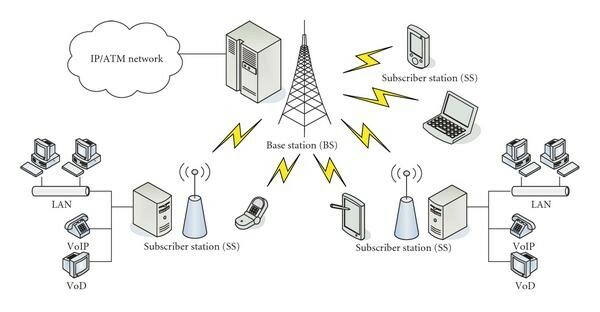 In this paper, we continue the works in [14, 15, 17] by extending the analytical model to perform an efficient dynamic capacity allocation, in which the nonreal-time (delay-tolerant) traffic of each Subscriber Station (SS) can utilize a portion of the spare bandwidth remaining after the capacity allocation for the real-time (delay-critical) traffic flows at every SS. Thus, the model incorporates the effect of the capacity allocation for the real-time polling service (rtPS), extended real-time polling service (ertPS), and unsolicited grant service (UGS) flows on the overall delay of the non real-time polling service (nrtPS) flow. The variable nrtPS capacity of the individual SS is allowed to depend on real-time capacities of every SS. The nrtPS capacity of each SS is determined by means of priorities among them for their non real-time traffic flows. This prioritization allows the realization of different service levels—probably for different prices—in terms of capacity utilization for non real-time traffic. This ensures a guaranteed portion of the total available nrtPS capacity for each SS also in the case when non real-time traffic is saturated at one or more other SSs. The analytical approach leads to a queueing model with batch packet service. The expression for the mean packet delay is given in terms of model probabilities, which are computed from the equilibrium distribution of a properly identified embedded Markov chain. The analytical model is applied to the performance evaluation of the uplink nrtPS traffic in the IEEE 802.16-based network. Beside providing numerical examples, we study the modeled influence of the real-time traffic on the delay of the nrtPS service flow. We discuss how to take into account an upper bound on mean delay of the nrtPS service flow at the SSs in determining the maximum of the sum of the real-time capacities at every SS. Finally, we introduce a cost model, which takes into account the QoS on delay constraint and on the real-time capacity parameters. The different aspects of this performance analysis have potential applications in network control, since they facilitate the setting of the capacity parameters to the requirements of the actual application scenario. The rest of the paper is structured as follows. Section 2 gives a brief summary of the channel allocation schemes in IEEE 802.16. In Section 3, we provide the analytical model including the details of the capacity allocation and the uplink scheduling. The analysis of the queueing model follows in Section 4. We determine the mean overall packet delay of the nrtPS service flow in Section 5. In Section 6, we give numerical examples for the performance analysis. Finally the conclusion in Section 7 closes the paper. The mandatory centralized point-to-multipoint (PMP) IEEE 802.16 architecture (see Figure 1) comprises a Base Station (BS) and one or more SSs in its vicinity. The packets are exchanged between BS and SSs via separate channels. The downlink (DL) channel is used for the traffic from the BS to the SSs, and the uplink (UL) channel is used in the reverse direction. IEEE 802. 16 general architecture. The standard defines two mechanisms of multiplexing the DL and the UL channels: Time Division Duplex (TDD) and Frequency Division Duplex (FDD). In FDD mode, the DL and the UL channels are assigned to different subband frequencies. In TDD mode, the channels are differentiated by assigning different time intervals to them, that is, MAC frame is divided into DL and UL parts. The border between these parts may change dynamically depending on the SSs bandwidth requirements. The SSs access the UL channel by means of Time-Division Multiple Access (TDMA). The structure of the MAC frame in TDD/TDMA mode is shown in Figure 2. IEEE 802. 16 MAC frame structure in TDD/TDMA mode. The current IEEE 802.16-2009 standard, as well as its future version IEEE 802.16 m , specifies Orthogonal Frequency-Division Multiple Access (OFDMA) at the physical layer. In the considered model, all the five service flow types are allowed at each SS (see Figure 3), each one with a dedicated Connection ID (CID) and a Service Flow ID (SFID). For UGS, rtPS, and ertPS packet service, the QoS guarantees are ensured by means of the necessary capacity allocations. The nrtPS and Best Effort (BE) service flows utilize spare bandwidth, where the nrtPS service flow is prioritized over the BE traffic. In the evaluation of the nrtPS packet service delay, we account also for the effects of the UGS, rtPS, and ertPS service flows. IEEE 802. 16 QoS architecture. We impose several limitations on the IEEE 802.16 model. The operational mode is PMP, and TDD/TDMA channel allocation scheme is used. Our TDD/TDMA model derived in this paper can be applied for both OFDMA-based versions (IEEE 802.16-2009 and IEEE 802.16 m). Only the uplink traffic is considered, as well as unicast polling is used for nrtPS, rtPS, and ertPS services. The uplink packet scheduler at the BS keeps an individual buffer for each SS to serve the nrtPS packets. The BE traffic is assumed to be saturated. There are SSs and 1 BS in the system, which together comprise stations. Each SS maintains separate buffers of infinite capacity for the uplink packets of different service flows. The nrtPS packets arrive at SS according to the Poisson arrival process with arrival rate for . Hence, the overall nrtPS packet arrival rate is . We call the nrtPS packets arriving to SS as -packets. The arrival processes at the different SSs are mutually independent. The packet length is fixed and equals bit, which includes data information and the header with packing/fragmentation overhead. The transmission rate of each channel is bps. Therefore, the transmission time of a data packet is . All time durations are measured in seconds. denotes the duration of each frame. While all the SSs are allowed to transmit in the uplink of one frame, they may be grouped by the reservation mechanism to reduce the polling overhead [14, 19]. Accordingly, in one frame only SSs belonging to one group are polled and are allowed to send their bandwidth request (BW-Req) messages. Then, the nonoverlapping groups are polled in consecutive frames. denotes the number of SSs in each group, and, hence, the number of groups is . The same SSs group is polled in every th frame. The minimal period between two consecutive pollings of the same SSs group is called a polling cycle. Thus, the length of a polling cycle is . The SSs grouping model is shown in Figure 4. The duration of the DL and the UL sub-frames are and , respectively. stands for the duration of the reservation interval, and is the maximum available duration of the uplink data transmission in a frame. Therefore, is given by . The transmission time of a BW-Req is . Hence, and can be expressed as . Expression (4) shows that the capacity available for the nrtPS traffic is given by an upper-limited discrete-time random variable, whose value is at least one. This ensures that the nrtPS traffic can not be blocked by the UGS, rtPS, and ertPS traffic flows. Finally, the BE service flow utilizes the remaining capacity, which is not used by the nrtPS traffic. This together with the restriction (R.4) ensures an efficient capacity utilization, in which the total available nonreal-time capacity ( ) is always utilized. The described capacity allocation scheme is illustrated in Figure 5. Summarizing, our general capacity allocation scheme enables asymmetric capacity allocation for the UGS, rtPS, and ertPS services, as well as asymmetric nrtPS traffic flows. Below, we formulate the assumptions of our model. This relation ensures the stability of the model. The BS uplink scheduler processing delay is negligible. The channel propagation time is negligible. The transmission channels are error free. A BW-Req sent by the SS represents the aggregated request for all nrtPS packets, which are accumulated in its outgoing buffer during the last cycle, that is, since the previous BW-Req sending. We leave the process of bandwidth requesting for rtPS and ertPS packets out of scope of this paper. Furthermore, we assume that the BS knows the number of rtPS and ertPS packets at each SS in every frame and thus it can take them into account calculating the actual available capacity for the nrtPS packets . We note that the actual uplink transmission requirements represented by the rtPS and ertPS requests are always granted, since they are below the available capacity. The fixed priority weights assigned to the SSs enable mutually independent uplink scheduling for the nrtPS service flows of the individual SSs. Thus, for the service of the aggregated BW-Req for the nrtPS packets, the BS maintains an individual BS grant buffer with infinite capacity for each SS. Let -polling slot stands for the th polling slot within the reservation interval of the frame, in which the group of SS is polled. At the end of the -polling slot, the BS immediately processes the requests for the nrtPS packets from SS , if any, and serves the individual BS grant buffer of SS . We refer to the end of the -polling slot as -reservation epoch. The BS grant buffer of SS is also served at the epochs following an -reservation epoch by time. Hence, all these epochs, including also the -reservation epochs, are called -scheduling epochs. The positions of the considered epochs are marked in Figure 6. Characteristic epochs of uplink scheduling. Receiving a request for the nrtPS packets from SS at an -reservation epoch, an individual BS grant is assigned to each nrtPS data packet of that request, and then these BS grants are placed into the corresponding individual BS grant buffer of SS according to their order in the request. Let the number of the BS grants in the buffer of SS be . During the service of the individual BS grant buffer of SS at an -scheduling epoch, the BS takes the available BS grants from that buffer up to the available capacity for the nrtPS service flow of SS ( ) and schedules them for transmission in the UL-MAP of the following frame. Their number equals the number of -packets transmitted in the next frame, . where stands for the smallest value of the set . An example of the BS uplink scheduling is illustrated in Figure 7. Example BS uplink scheduling for a single SS. The features of the considered uplink scheduling process can be summarized as follows. (F.1) The capacity requirements of the UGS, rtPS, and ertPS service flows are always satisfied. (F.2) The capacity allocation enables priorities for the nrtPS service flows ( at SS for ). This corresponds to a weighted round-robin scheduling of the dynamically variable capacity, which remains available after ensuring the service of the real-time traffic flows. (F.3)The scheduling mechanism ensures efficient capacity utilization, since the remaining capacity not used by the nrtPS traffic flow at each SS is filled the BE traffic at this SS. The individual polling slot for each SS in a polling cycle and the independent uplink scheduling for the individual SSs together imply that the statistical behavior of the BS grant buffer of a particular SS is independent from the behavior of those of the other SSs. Therefore, we model the stochastic behavior of the BS grant buffer of a particular SS by an individual queueing system. In this queueing system, the BS grants arrive to the BS grant buffer of SS at -reservation epochs and they are served at -scheduling epochs. Let be the number of BS grants in the BS grant buffer of SS at the th -reservation epoch for . The sequence is an embedded Markov chain on the state space . Let denote the probability of transition from state to state of the Markov chain, and it is the th element of the probability transition matrix . Let be the accumulated available capacity for the -packets during consecutive frames for . The distribution of is given as the -times convolution of the distribution of for . The definition of implies that it takes the value 0 with probability 1. It immediately follows that the minimum and maximum values of are and , respectively. where stands for the largest value of set . Let denote the equilibrium probability of the state in the Markov chain, and it is the th element of the probability vector . Furthermore, let be the column vector having all elements equal to one. To keep the computation tractable, an upper limit is set on the states, which results in the finite number of unknowns and equations in the system of linear equations. An appropriate value of depends on the required precision level, at which the probabilities for can be neglected. These probabilities, for , are set to 0. Let denote the probability that the number of BS grants in the BS grant buffer of SS at an arbitrarily chosen -scheduling epoch is exactly , and it is the th element of the probability vector for . The probability that an arbitrarily-chosen -scheduling epoch is the th after the last -reservation epoch is for . Note that by definition the 0th -scheduling epoch after the last -reservation epoch is that -reservation epoch. By definition, the time instant of handling the nrtPS packet requests from SS is the -reservation event. Similarly, by definition the instants of scheduling the BS grants in the BS grant buffer of SS are the -scheduling events. 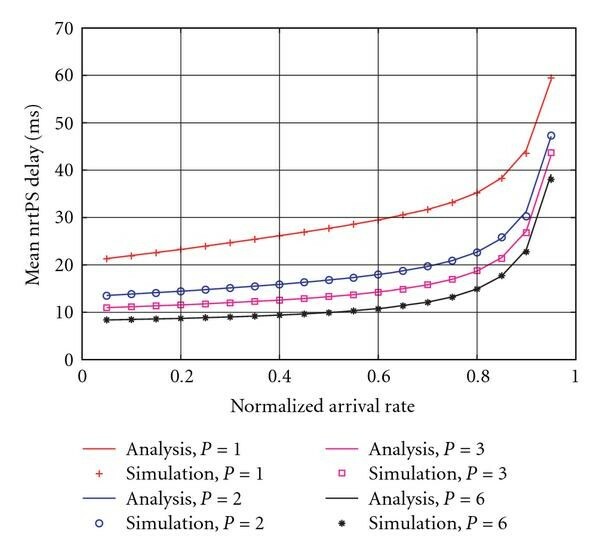 The positioning of the -reservation epoch and the -scheduling epochs (observation epochs) relatively to the -reservation and -scheduling events is shown in Figure 8. Positions of the observation epochs within a polling cycle. Here, is the reservation delay, which is defined as the time interval from the -packet arrival to SS until the start of sending a corresponding BW-Req to the BS. We define the grant time of the tagged -packet as the -scheduling epoch in the frame preceding the one, in which the tagged -packet is transmitted. is the scheduling delay, which is defined as the time interval from the end of sending a BW-Req of the tagged -packet to its grant time. is the transmission delay, which is defined as the time interval from the grant time of the tagged -packet to the start of its successful transmission in the UL sub-frame. 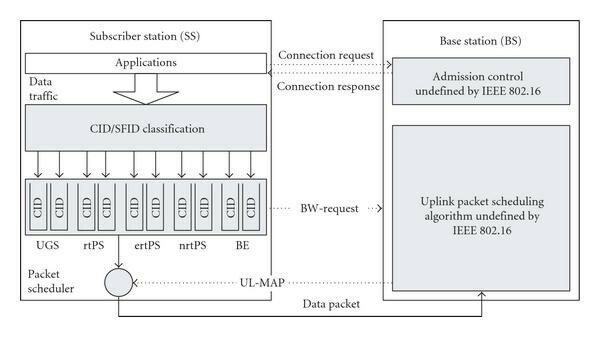 In this section, we apply the derived analytical model to the performance evaluation of the uplink nrtPS packet service in the IEEE 802.16-2009 network. Here, we provide numerical examples to assess the performance of the IEEE 802.16 uplink nrtPS service flow evaluated with the considered analytical model. In order to generate performance data, a simulation program for IEEE 802.16-2009 MAC was developed. The program is an event-driven simulator that accounts for the discussed restrictions on the considered system model (see Section 3). In our simulations, we set the default values recommended by WiMAX Forum  system evaluation methodology, which are also common values used in practice . We assume a 10 MHz TDD system with 5 ms frame duration, PUSC subchannelization mode, and a DL : UL ratio of 2 : 1. According to , the UL sub-frame comprises 175 slots. Assuming MCS of 16 QAM 3/4, the IEEE 802.16-2009 system transmits 16 bytes per UL slot. We consider fixed packet length of 80 bytes (5 slots) for all service flows, which results in having capacity to send 30 packets per UL sub-frame. The remaining 25 UL slots represent the necessary control overhead. For the sake of simplicity, we firstly investigate the case of the symmetric system. The arrival flows have constant rate of and for all the SSs. Assuming fixed number of SSs, we also set constant capacity-related parameters , , and (see Section 3.3). We illustrate the simplest case of the actual rtPS and ertPS capacity distribution, that is, uniform in the range . The summary of the considered evaluation parameters is given in Table 1. In Figure 9, we plot the dependency of the mean nrtPS packet delay on the arrival rate for different groupings, that is, for different values of . Mean nrtPS packet delay in symmetric system with SSs grouping ( ). The next example in Figure 10 shows the nrtPS delay of SS within the simplest asymmetric system of 2 SSs and different priority weights and . Mean nrtPS packet delay at SS in asymmetric system ( ). Both Figures 9 and 10 show very good accordance between the analytical and the simulation values. In this subsection, we study the influence of the capacity allocation for the UGS and the real-time traffic on the mean packet delay of the nrtPS service flow in the symmetric system for . 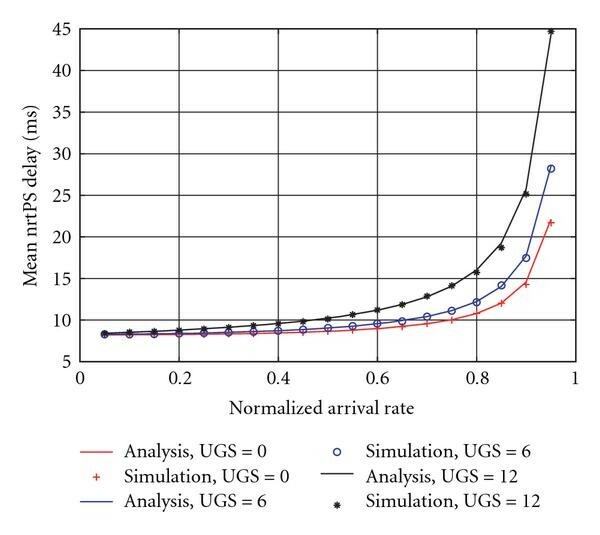 In particular, Figure 11 demonstrates the dependency of the mean overall nrtPS delay on the normalized arrival rate for different total UGS capacity values per frame. Here, the minimum and the maximum (e)rtPS capacity per frame is set 6 and 12 packets, respectively. It can be seen in the Figure 11 that increasing the total UGS capacity per frame leads to higher mean overall nrtPS delay, as expected. This is due to the impact of the total UGS capacity on the transmission and scheduling delays (see relations (21) and (2)). Influence of the UGS traffic on the mean nrtPS packet delay in symmetric system ( ). Now, we vary the maximum (e)rtPS capacity per frame. In Figure 12, the mean overall nrtPS delay is plotted as a function of the normalized arrival rate for different maximum (e)rtPS capacity values per frame, as well as both uniform and truncated geometric distributions. Here, the UGS capacity per frame is set 0 packets, and the minimum (e)rtPS capacity per frame is 6 packets. We can observe in the figure that the dependency on the maximum (e)rtPS capacity values for uniform distribution is similar to the dependency for the total UGS capacity (see Figure 11). However, comparing the left and the right sides of Figure 12, we can conclude that the distribution of the (e)rtPS capacity values has an essential impact on the mean overall nrtPS delay. The positions of the curves relatively to each other on the right side of Figure 12 are the consequences of the used truncating of the geometric distribution. 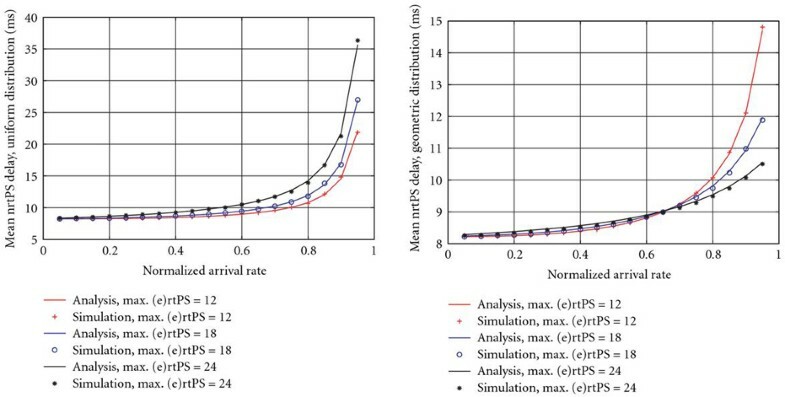 Influence of (e)rtPS traffic on the mean nrtPS packet delay in symmetric system ( ) for uniform distribution (a) and for truncated geometric distribution with parameter 0. 5 (b). Our modeling can be also used to enforce specified upper bounds on mean nrtPS packet delays at every SS in a specified range of loads. These bounds can be different for the individual SSs. In this case, the total amount of uplink real-time capacities in the network ( ) is maximized over a restricted parameter set, which is determined by the specified upper bounds on mean nrtPS packet delays and by the specified range of loads. The priority weights of the SSs are assumed to be given. The minimum can be numerically determined as a function of the load and the real-time capacity parameters at every SS ( and the distribution of for ), by applying the expressions for the mean overall delay of the tagged -packet (22). the nrtPS capacity at the SSs are determined by means of priorities among them. The considered analytical model is verified by means of simulation. This verification shows an excellent accordance between the analytical and the simulation results in a wide range of parameter settings. Hence, our analytical model can be applied to model and analyze the delay of the uplink nrtPS traffic in IEEE 802.16-based network. Based on the numerical examples for the performance evaluation, the following conclusions can be drawn. The dependencies of the mean nrtPS packet delay on the total UGS capacity and on the maximum (e)rtPS capacity for uniform distribution show similar tendencies. The distribution of the (e)rtPS capacity has essential impact on the mean nrtPS packet delay. These conclusions remain valid also in case of non-saturated BE traffic, since the BE traffic does not influence the nrtPS packet delay. This is due to the applied capacity allocation rule, in which the nrtPS traffic has priority over the BE traffic at the same SS. The presented analytical model also enables to enforce specified upper bounds on the mean nrtPS packet delays at every SS in a specified range of loads. In this case, the optimal value of the total amount of real-time capacities can be determined. In case of a more general QoS requirement (delay constraint), the optimal set of priority weights of the SSs can be determined by using a specific cost model (see Section 6.4). This work is supported by Tampere Graduate School in Information Science and Engineering, Nokia Foundation, and HPY Research Foundation.